Proudly serving the needs families and individuals in the greater Phoenix area since 2010, Low Budget Movers has consistently operated as a moving company providing great rates. With more than a thousand moves to our name since then we are proud to say our commercial and residential movers have earned a great reputation and top ratings. 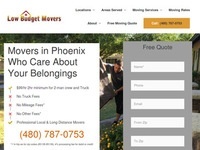 Low Budget Movers was founded by Brian Myers, a longtime moving technician who grew fed up with the unethical practices of large-scale moving companies in Phoenix, AZ. Eventually, he left the franchise and started Low Budget Movers with a renewed focus on integrity and transparency with moving customers. Importantly, all of our customers speak directly to Brian when calling our company. We offer residential, commercial and specialty services to our customers. Each of these services is accompanied by a full-value, zero deductible insurance contract for the condition of the goods being moved. The fact that claims are so rare makes our insurance much more affordable than the policies of other Arizona moving companies. Our movers are qualified to perform college moves, commercial moves, residential moves and specialty moves of all kinds. We are equally competent at completing both in-state and long-distance moves, providing world-class service at the lowest prices on the market in each case. Contact us for a quote and get an estimate on the cost of your move directly from Brian today!